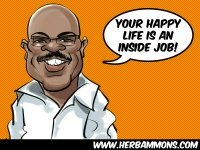 SYNERGY COMMUNITY DEVELOPMENT CENTER, INC.
Herb Ammons has a message for people who are are plagued by self doubt; feeling this way is normal and you are not the first or the only one to ever have this happen. While knowing that it is ‘normal’ to face self doubt and even depression, Herb offers a source of encouragement. Click here to read a series of articles that will encourage you when you confront tough times.